Set in a wooded valley dropping steeply to the hamlet of Durgan on the shore of the beautiful Helford estuary, Glendurgan is one of the great sub-tropical gardens of the South West. Exotic trees and shrubs flourish amidst open glades carpeted with wild flowers. This garden is unique with its superb subtropical garden and restored 19th-century laurel maze. 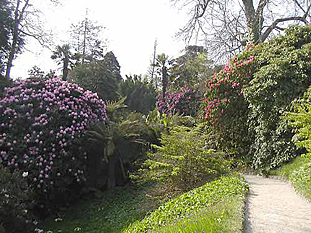 Set within a wooded valley with many large trees and shrubs, the garden is packed with rare and exotic plants from around the world, these thrive in the warm temperate climate of the coast of Cornwall. 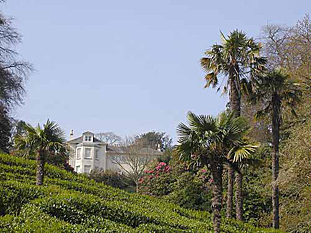 Glendurgan Garden is purposefully only a few miles away from the Fal estuary, this deep-water harbour that was in the past the first port of call for ships returning from the Americas, the Far East, Africa and the Antipodes. This provided the Fox family with an ideal way of importing plants easily from all over the world, over the years many species found their way into the garden Alfred Fox planted in the 1820s and 1830s. The now fully restored 1833 laurel maze and the ‘Giant’s Stride’ – a pole with ropes to swing from – are unusual and popular features enjoyed especially by children. Alfred Fox built the unpretentious, creeper-clad house at the valleys top very soon after coming to Glendurgan. The house has views over an expanse of grass towards Helford, framed by the magnificent foliage. Between the 1820s and 1830s Fox designed and began to lay out the garden. Many of the fine old trees were planted by Alfred Fox including the two splendid tulip trees below the house. He was also responsible for the many serpentine paths laid out in the romantic taste. In 1833 he planted the laurel maze. The hedges of the maze on a slope resemble a serpent curled up in the grass. 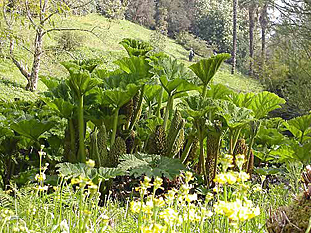 The valley is home to tender exotic plants, showing great variety in shape and colour throughout the year. Interesting varieties such as a weeping swamp cypress, a Japanese loquat, weeping Mexican cypress, cedars, pines, firs etc. During the spring the garden shows bluebells, Lent Lilies, columbines and primroses followed by rhododendrons, magnolias and camellias. Midsummer sees Bentham’s cornel in the valley slopes later on in the year the hydrangeas and eucryphias take over. The garden also has some individual gardens within it for instance the Holy Corner planted with trees and shrubs associated with the Bible including a yew, a tree of heaven, an olive, a tree of thorns and a Judas tree. A tropical garden has been created with bamboo, tree ferns and ‘Gunnera manicata’, with its huge umbrella-like leaves. The gently sloping winding paths descend down the valley eventually leading to the tiny fishing village of Durgan. ½ mile south-west of Mawnan Smith, on road to Helford Passage.